North Arlington | THE RIDGEWOOD BLOG. East Rutherford NJ, For the first time in 32 years, the men’s World Cup is coming back to North America. FIFA’s 200-plus member associations gathered in Moscow on Wednesday and voted to award 2026 World Cup hosting rights to the United States, Canada and Mexico. In a coup for the Trump administration , 60 of 80 games will be in the United States, with 10 apiece in Canada and Mexico. Those 60 include every game from the quarterfinals onward. Canada and Mexico have proposed three host cities each: Toronto, Montreal and Edmonton will stage games north of the U.S. border, while Mexico City, Guadalajara and Monterrey will be match sites down south. The U.S. has proposed the Rose Bowl (Pasadena, Calif.) for the opener; Mercedes-Benz Stadium (Atlanta) and AT&T Stadium (Arlington, Tex.) for semifinals; and New Jersey’s MetLife Stadium (East Rutherford, N.J.) for the final , which will have a capacity of more than 87,000 for the event. Unlike this year, the United States will automatically qualify for the World Cup as a host country. Ridgewood NJ, On May 5, 1868, General John A. Logan, leader of an organization for Northern Civil War veterans, called for a nationwide day of remembrance . “The 30th of May, 1868, is designated for the purpose of strewing with flowers, or otherwise decorating the graves of comrades who died in defense of their country during the late rebellion, and whose bodies now lie in almost every city, village and hamlet churchyard in the land,” he proclaimed. Many Northern states held similar commemorative events and reprised the tradition in subsequent years; by 1890 each one had made Decoration Day an official state holiday. Southern states, on the other hand, continued to honor their dead on separate days until after World War I. For many decades, Memorial Day continued to be observed on May 30, the date Logan had selected for the first Decoration Day. But in 1968 Congress passed the Uniform Monday Holiday Act, which established Memorial Day as the last Monday in May in order to create a three-day weekend for federal employees; the change went into effect in 1971. The same law also declared Memorial Day a federal holiday. Arlington VA , The American Legislative Exchange Council (ALEC) today released the much anticipated 2018 edition of Rich States, Poor States. Utah again earns the top spot for states with the best economic outlook, followed by Idaho, Indiana, North Dakota and Arizona. Several states’ success in increased rankings can be tied directly to the success of federal tax reform and the resources it gave to lawmakers to cut taxes at the state level. The 11th edition of Rich States, Poor States is characterized by great movement in state economic performance and outlook as a result of federal tax reform and the resulting actions of certain states. “The shakeup in rankings is exciting and a testament to how states are always competing to offer the most pro-growth tax climate. When states compete on the merits of good public policy, ultimately the taxpayer ends up being the real winner,” said North Carolina State Rep. and National Chairman Jason Saine. In the past five years alone, 30 states have significantly reduced their tax burdens. Those that fail to adapt to this competitive environment can fall behind by simply standing still. The facts remain clear that pro-growth policies are working and there is a clear trend in favor of market-oriented reforms. 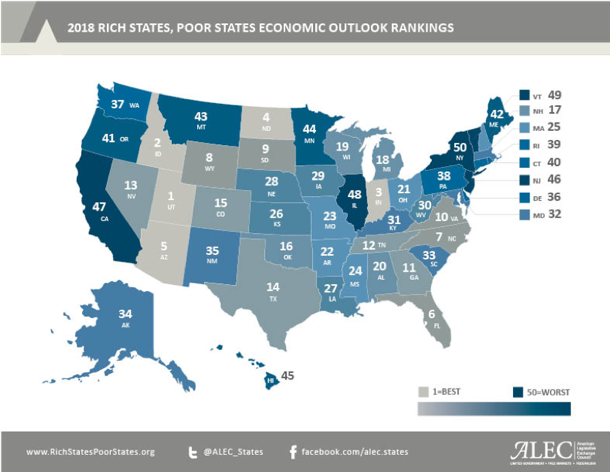 Rich States, Poor States examines the latest trends in state economic growth. The data ranks the 2018 economic outlook of states using 15 equally weighted policy variables, including various tax rates, regulatory burdens and labor policies. The 11th edition examines trends over the last few decades that have helped or hurt states’ economies. Used by state lawmakers across America since 2008, Rich States, Poor States: ALEC-Laffer State Economic Competitiveness Index, is authored by White House Advisor and economist Dr. Arthur B. Laffer, White House Advisor and Economist Stephen Moore, and Jonathan Williams, Vice President of the American Legislative Exchange Council Center for State Fiscal Reform. New Jersey is currently ranked 49th in the United States for its economic performance. This rank is a backward-looking measure based on the state’s performance (equal-weighted average) in three important performance variables shown below. These variables are highly influenced by state policy. 3643 – Establish a CAP Bank – Establishes that the final appropriations in the CY 2018 budget will be increased by 3.5% over the previous year’s final appropriations, amounting to $1,351,174.37 in excess of the increase in final appropriations otherwise permitted. This is done in accordance with N.J.S.A. 40A:4-45.14, and is advisable in order to establish a CAP Bank. 18-131 Authorize Site Access to Geographic Services, Inc. to North Walnut Street Parking Lot for Sampling Purposes – Authorizes Geographic Services, Inc. to have site access to the North Walnut Street parking lot to sample the existing groundwater monitoring wells as part of the investigation of the subsurface contamination at 32 Cottage Place. This authorization is granted for a period of time not to exceed three years. Geographic Services, Inc. will comply with all Village regulations in performing their work and will also share the information they obtain with the Village of Ridgewood. Ridgewood NJ, the Ridgewood Police report that on February 4, patrol units responded to 8 Godwin Avenue on a report of an assault in progress. Upon arrival, patrol located both parties which were involved in the physical altercation. Neither party wanted to sign criminal complaints and both refused medical attention at the scene. While investigating the incident, one involved party was found to have an active warrant for arrest out of North Arlington, N.J. so officers arrested the 19-year-old male from Glen Rock, N.J. The North Arlington Police were notified and the arrestee was later released on his own recognizance after a new court date was provided. Ridgewood NJ, Five men, including two individuals who formerly worked at scam call centers in India, each pleaded guilty within the past two weeks for their respective roles in a massive telephone impersonation fraud and money laundering scheme perpetrated by India-based call centers. From May 26 to June 6, Rajubhai Patel, 32, an Indian national most recently residing in Willowbrook, Illinois; Viraj Patel, 33, an Indian national most recently residing in Anaheim, California; Dilipkumar Ambal Patel, 53, an Indian national most recently residing in Corona, California; and Fahad Ali, 25, a Pakistani national and permanent U.S. resident most recently residing in Dyer, Indiana, each pleaded guilty to money laundering conspiracy before U.S. District Court Judge David Hittner of the Southern District of Texas. Hardik Patel, 31, an Indian national most recently residing in Arlington Heights, Illinois, pleaded guilty to wire fraud conspiracy before the same court on June 2. Sentencing dates are pending for all five defendants. According to admissions made in connection with the plea agreements, the five men and their co-conspirators perpetrated a complex scheme in which individuals from call centers located in Ahmedabad, India, impersonated officials from the IRS and U.S. Citizenship and Immigration Services (USCIS), and engaged in other telephone call scams, in a ruse designed to defraud victims in the U.S. Using information obtained from data brokers and other sources, call center operators targeted U.S. victims, who were threatened with arrest, imprisonment, fines or deportation if they did not pay alleged monies owed to the government. Victims who agreed to pay the scammers were instructed how to provide payment, including by purchasing stored value cards or wiring money. Upon payment, the call centers would immediately turn to a network of “runners” based in the U.S. to liquidate and launder the fraudulently obtained funds. Based on the statements in his June 2 guilty plea, beginning in August 2012, Hardik Patel owned and managed the day-to-day operations of an India-based scam call center before later leaving for the U.S. While in India, in his capacity as a manager, Hardik Patel communicated extensively via email, text, and other means with various India-based co-defendants to operate the scheme and exchange scripts used in the scheme, coordinate the processing of payments from scammed victims, obtain and exchange lead lists used by callers to target U.S. victims, and exchange spreadsheets containing the personal identifying information (PII) of U.S. persons misappropriated by the scammers to register reloadable cards used in the scheme. Hardik Patel also managed worker payroll and kept detailed records of profits and expenses for various associated scam call centers. Hardik Patel continued to communicate with India-based co-defendants about the scheme and assist with the conspiracy after he moved to the U.S. According to his June 6 guilty plea, Rajubhai Patel operated as a runner and assisted a co-defendant in managing the activities of a crew of other runners, based primarily out of Illinois, who liquidated victim funds in various locales in the U.S. for conspirators from India-based call centers. Rajubhai Patel communicated about the liquidation of scam funds via electronic WhatsApp communications with domestic and India-based co-defendants, purchased reloadable cards registered using the misappropriated PII of U.S. citizens that were later used to receive victims’ funds, and used those cards to purchase money orders and deposit them into various bank accounts of co-defendants and others as directed. Rajubhai Patel also admitted to creating and maintaining spreadsheets that detailed deposits, payments to co-conspirators, expenses and profits from the scheme. According to admissions made in his June 2 guilty plea, Viraj Patel first became involved in the conspiracy between April and September 2013, prior to entering the U.S., when he worked at and assisted with overseeing the operations of a call center in India engaging in scam activity at the behest of a co-defendant. After entering the U.S., beginning in December 2014 Viraj Patel engaged in additional activities in support of the scheme in exchange for a cut of the profits, including serving as a processor of scam victim payments and as a runner engaging in the purchase and liquidation of cards loaded with victim scam funds. Viraj Patel communicated with various India-and U.S.-based co-defendants in furtherance of the conspiracy, and also obtained and circulated lead lists to his co-conspirators containing the PII of U.S. citizens for use by the call centers in targeting victims of the various fraud schemes and to register reloadable cards used to launder the proceeds of the schemes. Based on the admissions made in his May 26 guilty plea, since late 2013, Dilipkumar A. Patel operated as a runner in and around Southern California, along with other co-defendants based in the region. At the direction of India-based co-conspirators, often via electronic WhatsApp communications, Patel admitted to participating in the purchase of reloadable cards registered with the PII of U.S. citizens, and the subsequent liquidation of victim scam funds loaded to those cards by co-conspirators, while keeping a percentage of the victim funds on the cards for himself. According to his guilty plea, also on May 26, beginning in or around 2013, Fahad Ali worked as a member of a crew of runners operating in the Chicago, Illinois area, the Southern District of Texas and elsewhere throughout the country. Ali admitted that he first served as a driver for an Illinois-based co-defendant engaging in activities in furtherance of the conspiracy. Ali later operated at the direction of that co-defendant and others, via various means of communication, including text messages, to purchase reloadable cards, and then liquidate victim scam proceeds placed on those cards by India-based co-conspirators, in exchange for recurring payments. Ali also admitted to using false identification documents to receive wire transfers from victims of the fraud. To date, Hardik Patel, Rajubhai Patel, Viraj Patel, Dilipkumar A. Patel, Fahad Ali, 51 other individuals and five India-based call centers have been charged for their roles in the fraud and money laundering scheme in an indictment returned by a federal grand jury in the Southern District of Texas on Oct. 19, 2016. Including the most recent pleas, a total of nine defendants have pleaded guilty thus far in this case. Co-defendants Bharatkumar Patel, Ashvinbhai Chaudhari, Harsh Patel and Nilam Parikh previously pleaded guilty on April 13; April 26; May 11; and May 18, respectively. HSI, DHS-OIG and TIGTA led the investigation of this case. Also providing significant support were: the Criminal Division’s Office of International Affairs; Ft. Bend County, Texas, Sheriff’s Office; police departments in Hoffman Estates and Naperville, Illinois, and in Leonia, New Jersey; San Diego County District Attorney’s Office Family Protection and Elder Abuse Unit; U.S. Secret Service; U.S. Small Business Administration, Office of Inspector General; IOC-2; INTERPOL Washington; USCIS; U.S. State Department’s Diplomatic Security Service; and U.S. Attorneys’ Offices in Northern District of Alabama, District of Arizona, Central District of California, Northern District of California, District of Colorado, Northern District of Florida, Middle District of Florida, Northern District of Illinois, Northern District of Indiana, District of Nevada and District of New Jersey. The Federal Communications Commission’s Enforcement Bureau also provided assistance in TIGTA’s investigation. Senior Trial Attorney Michael Sheckels and Trial Attorney Mona Sahaf of the Criminal Division’s Human Rights and Special Prosecutions Section, Trial Attorney Robert Stapleton of the Criminal Division’s Money Laundering and Asset Recovery Section and Assistant U.S. Attorneys S. Mark McIntyre and Craig M. Feazel of the Southern District of Texas are prosecuting the case. Courtesy of United States Department of TransportationIf last year is any indication, police in some of New Jersey’s smallest municipalities will be giving out the largest number of distracted driving tickets during the month-long crackdown that ends April 21. Owning a car offers freedom and convenience, but it also comes with stress. As with most big purchases, the state you live in can have a huge impact on costs, and a new study confirms that car ownership in coastal cities can be a time consuming and expensive experience. According to SmartAsset, a personal finance advice site, Newark, NJ, is the worst city in the United States to own a car. Why? Newark’s proximity to New York City makes traffic a nightmare, as nearly 5 million people in the metro area attempt to drive to work every day. This gridlock costs the average driver $1,739 in traffic costs, due to travel time and extra fuel consumed while idling. To compile its list, SmartAsset looked at several factors of car ownership, including number of hours spent in traffic, annual cost of traffic, the number of repair shops, accessibility to parking garages, stress, public transportation options and theft. Speaking of theft, Newark is also a tough on car owners because, well, your car might get stolen. According to the New Jersey State Police, there were 2,412 total motor vehicle thefts in Newark in 2014. That is equal to 8.66 car thefts per 1,000 residents. In comparison, Arlington, Va. had the lowest number of thefts per capita on SmartAsset’s list, with 157 thefts a year, or 0.7 thefts per 1,000 residents.